Mine, you are to know, is a white Melancholy, or rather Leucocholy… which though it seldom laughs or dances, nor ever amounts to what one calls Joy or Pleasure, yet is a good easy sort of a state … But there is another sort, black indeed, which I have now and then felt, that has something in it like Tertullian’s rule of faith, Credo quia impossible est; for it believes, nay, is sure of everything that is unlikely, so it be but frightful; and on the other hand excludes and shuts its eyes to the most possible hopes, and everything that is pleasurable; from this the Lord deliver us! ~ Thomas Gray the Poet, writing to his friend Richard West in 1742. I begin to Emerge from a deep pit of Melancholy, Melancholy without any real reason for it, a Disease which God keep you from & all good men. ~ William Blake, Letters to Cumberland: 2nd July, 1800. These are the dark November days, when the English hang themselves! ~ Voltaire (1694 – 1778). The Title I have chosen for this Treatise, is a Reproach universally thrown on this Island by Foreigners, and all our Neighbours on the Continent, by whom Nervous Distempers, Spleen, Vapours, and Lowness of Spirits, are, in Derision, call’d the ENGLISH MALADY. And I wish there were not so good grounds for this Reflection. The Moisture of our Air, the Variableness of our Weather, (from our Situation amidst the Ocean) the Rankness and Fertility of our Soil, the Richness and Heaviness of our Food, the Wealth and Abundance of the Inhabitants (from their universal Trade), the Inactivity and sedentary Occupations of the better Sort (among whom this Evil mostly rages) and the Humour of living in great, populous, and consequently unhealthy Towns, have brought forth a Class and Set of Distempers, with atrocious and frightful Symptoms, scarce known to our Ancestors, and never rising to such fatal Heights, nor afflicting such Numbers in any other known Nation. These nervous Disorders being computed to make almost one third of the Complaints of the People of Condition in England. Melancholia was thought of as a primary form of madness in the 18th century and earlier. 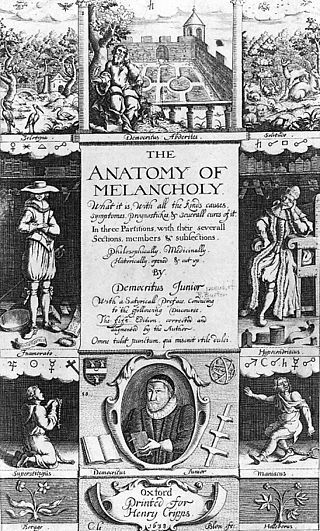 The magisterial book on all forms and concepts of the disease was written in England: “The Anatomy of Melancholy, What it is: With all the Kinds, Causes, Symptomes, Prognostickes, and Several Cures of it. In Three Maine Partitions with their several Sections, Members, and Subsections. Philosophically, Medicinally, Historically, Opened and Cut Up” by Robert Burton, first published in 1621. Melancholia means ‘black bile’, one of the four bodily humours recognised by the Hippocratic and Galenic systems of medicine that prevailed in Britain and elsewhere well into the 18th century. It was an excess of this ‘black bile’ which was thought to cause the malady. Aristotle thought black bile might ‘ferment’ to produce the anger and depression seen as characteristic of the malady. Whatever the differences between writers on their views of how the disease was caused, all agreed that it led to symptoms of intense mental pain, depression and a general sense of failure and gloom. In severe cases, it caused people to become insane and kill themselves. There were probably as many treatments offered as there were physicians interested in the disorder, from locking people up to enemas and special dietary regimes. Amongst these, sea bathing (‘thalassotherapy’) became quite prevalent. Not our pleasant kind of splashing about in the sea, but a strict and violent form of immersion designed to induce first shock (from being plunged into cold water) then fear (by being held under until almost drowning). The purpose was, apparently, to cause the brain to ‘re-arrange’ itself into a better and more harmonious state. Others made the patient sit on a stool which whirled them around until they became dizzy and disoriented. Benjamin Franklin even devised a primitive form of electro-convulsive therapy, using an electrostatic generator (a machine which produces electricity by rubbing material against a glass ball or cylinder turned by a crank) with a Leyden jar to stored the energy produced. On the whole, he considered his results disappointing, though he did note the propensity for electric shocks to the brain to destroy memory—something later proponents of electro-convulsive therapy seem to have missed for many decades. The plain fact was that medical knowledge of the time was more or less helpless in the face of most mental illnesses, so we should not be too critical. Even today, clinical depression is not treatable easily. Not being a medical man, my interest was caught rather by the ways in which the concept of melancholy came to be seen as especially associated with Romanticism and creativity in the arts. In the 18th century, the concept of sensibility—a refined feeling of emotion and delicacy of perception—was synonymous with social refinement and good breeding. However, it was soon recognised that there was a fine line between a good supply of delicate feeling and various forms of mental disarrangement. The melancholic was seen as brooding and restless; fearful of the future and pessimistic about the possibility of improvement. She may also see life as essentially hollow and devoid of purpose. And, in the melancholic’s constant longing for something inexpressible and unattainable, many would find the seeds of that creative yearning generally associated with great artists of every kind. While it’s clear that melancholy (in its artistic sense) is not the same as depression, it could be hard to avoid moving from the one into the other. Depression generally destroys motivation and induces lethargy and a pervasive sense of the hopelessness of any endeavour. Melancholy’s intensity of introspection and reflection produced in some a powerful driving force towards artistic achievement. In others, it slipped into an aesthetic flaccidness and self-indulgence. His soul shall taste the sadness of her might. Melancholy can be said to be almost an inevitable by-product of the romantic outlook, with its emphasis on extremes of emotion. ‘The Sublime’ in landscape, for example, was often associated with places that were equally seen as dangerous, like mountain gorges, or productive of solitude. Romantic love comes tightly yoked to the pains of love rejected or lost. Violent sensitivity can produce negative emotions as easily as positive ones. Indeed, as idealists and visionaries—at least in their own eyes—romantics were condemned to the loneliness produced by the solitude of their position. They saw the world as out of step with them; the world saw exactly the opposite. Death alone could free them from a life in which sorrow and loss were constant themes. Were the English especially melancholy? There certainly does seem to be a quintessentially English attraction to a certain kind of wistful nostalgia that easily slips into melancholy. As far back as John Dowland, English musicians tended to write music that looks back to paradise lost, not forward to some new Jerusalem. The ‘dying fall’ in melody is extremely common in English music of all kinds. In Georgian times, violent clashes of ideology were everywhere. The inherent scepticism of melancholia—its sense of understanding the limits imposed by human fallibility; its awareness of death and impermanence—offered a gentler response to the problems of the time than bloody revolution. Perhaps that’s why there was never an English Revolution to follow the one in France: the English were insufficiently idealistic in temperament, preferring to rely on tradition and custom rather than philosophical theorising. Even today, we English are deeply sceptical of abstractions. Our nostalgia for times past is rarely compatible with what David Hume saw as the “corrupt philosophical speculation about liberty” which led to revolution . George Cheyne had claimed that around a third of the English upper classes suffered from some type of nervous disorder. Given the vague generalisations that passed for diagnoses at the time, that figure might easily be reached. Indeed, if sensibility and some kind of melancholy were seen as natural bedfellows, to claim to suffer from the one implied possession of the other. Add in ‘hysteria’ and hypochondria as melancholic symptoms and you have the perfect disease for the idle rich: one that can only be enjoyed through abundant leisure and the wealth to pay for an endless succession of doctors and remedies. Horace Walpole is perhaps a good example to finish with. He was intensely self-centred and more than a little conceited about the refinement of his taste. He was also given to periods of ‘nervous disorder’. Were these brought on by his exquisite artistic sensibility? Were they due to being an obviously homosexual man who could not exercise his sexual preference openly in the high society of the time? Or were they yet more examples of his self-absorption and the lack of any significant outlet for his prodigious talents? Maybe it was all of these—or none of them. You pays your money and you takes your choice.